I can’t remember exactly what route I chose through southern Utah last summer of road tripping. 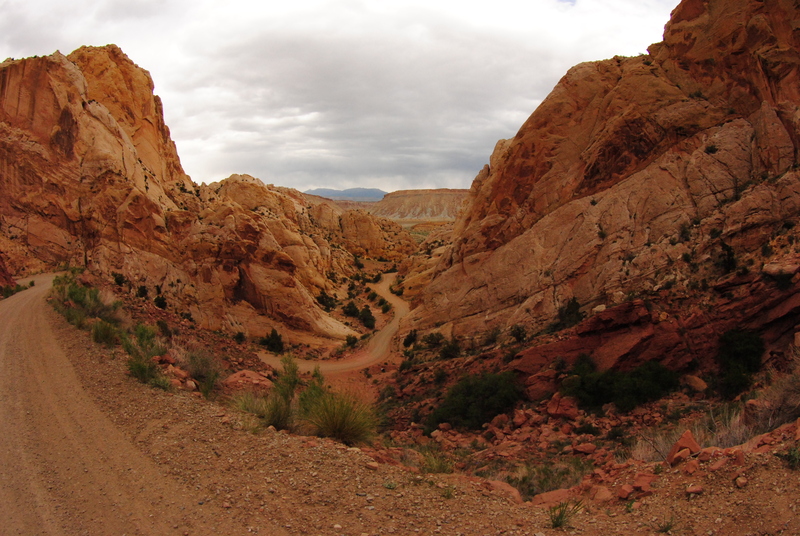 I just remember, after passing through the back side of capitol reef national park during a week of trail running slot canyons and car bivouacking- I began to follow back roads and two lane highways at the direction of each day’s impulse. At some point, my pirate ship vessel- a 2001 Subaru outback- ran out of gas; just then, I emerged in a small town called Boulder, Utah. That’s where I stumbled upon the shimmering utopia that is the Hills and Hollows Mini Mart. What’s the significance of a good convenience store? For the dirtbag traveler, grimy and disoriented from weeks of hiking and camping, it is everything. It’s the welcoming arms of comfort food- usually not very healthy. It’s the brewed coffee within easy reach that doesn’t require camp fire preparation. It’s the small toiletries that make the rugged road more civilized; like baby wipe showers, toilet paper, and gallon jugs of water. All of these items can be expected in any general store, no matter how far off the beaten path they might rest. I had these expectations in mind when I emerged onto that rustic gas station in the small Utah town, but I had little idea of the treasure trove awaiting me. When I entered the store, I knew exactly what gem I had emerged on to. It’s hard to be picky about food when on the road, even for the most snob whole-fooder like myself. Given the means, I would readily live entirely on only natural “rabbit” foods- fiber, carbs, fats, and all. But sometimes, when going days without coming across a grocery store produce section- those cheesy snacks, fatty potato chips, and sugary candy bars lining gas station general store shelves can be too hard to pass up. Stumbling into the Hills and Hollows, I had to take a long pause to adjust my eyes to the spectacle I was witnessing. Not only were there bags of chips, and breads, and snacks that read, “Organic” and “Gluten Free”- to attract the snob like myself- there were also freshly picked produce, and a shelf full of strange, Ziploc bagged goodies: dried fruits of all types, labeled with homemade stickers and price tags. I picked one up, flabbergasted. They were store bought Ziploc bags, with home-dehydrated food inside. To my immediate dismay- I realized, anyone could have packaged them- and anyone could have later opened them up and put their grubby fingers inside. Is this legal to sell? I wondered. I looked around the store, and found the only other customers: a group of barefoot, messy haired, earth and marijuana smelling hippies. I hate to use that term- “hippie”- because the description can be so easily thrown about. But that’s exactly what these young people were- genuine hippies! Their hands were covered in dirt, and they kept referring to “the farm.” They looked awfully happy there in that small town setting, counting change for the few small goods they hoped to purchase. It reminded me of the movie, “Big Fish,” when the protagonist emerged onto the town of Spectre, where everyone walked around barefoot and carefree. Repressing my desire to discard my shoes and vehicle to join their commune, I resolved to grab a couple bags of figs and dates, before leaving the charming little oasis. All the drive up through salt-lake city, and into Idaho, Wyoming, and Montana, I thought often about the Hills and Hollows. I couldn’t help but compare every general store and gas station I stopped in along the way with that special one in Boulder, Utah. The omnipresent regret I carried, was that I had not spent more time there. Perhaps I was scared, if I lingered too long, I might not ever leave that place. Call it luck or call it fate, but after my road trip, I met up with an ex-girlfriend I hadn’t talked to in over a year- the elusive “white buffalo” of girlfriends (if you know what I mean)- and we talked about our travels while separated. Interestingly enough, we both agreed, our favorite place had been southern Utah. Was it a coincidence we had separated, only to find common ground in the same, random general store in a tiny Utah town? You make the call; all I know is that Chelsea and I are married now. And someday soon, we plan on making the pilgrimage back to that tiny Utah town with its general store utopia. Photo Essay: Backpacking in the Hunter-Frying Pan Wilderness (With a toddler and infant).